Aaaand it's up! Very late. I apologize. For the third week in a row, no access to either a computer or the internet during the weekend. I am so behind on work, you have no idea. 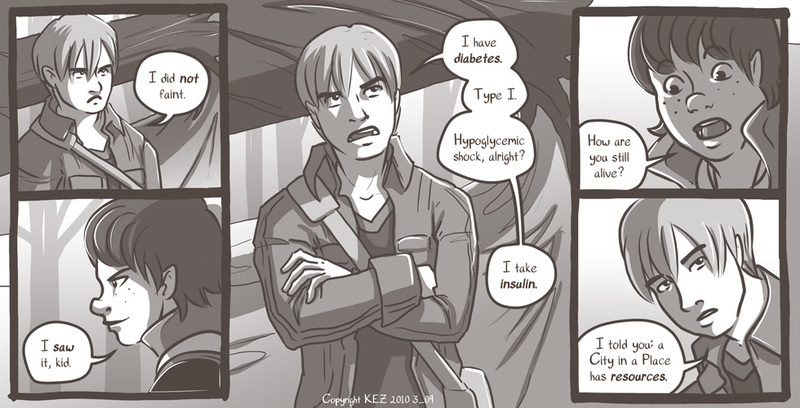 Colbey asks the question because, hey, it's so easy to produce insulin in a post-apocalyptic world. I mean, sure, they could go back to powdered goat pancreas, but that's just not the real stuff! Yes, hypoglycemic shock (hypoglycemia) can be induced by periods of intense stress. You don't necessarily have to have diabetes to have episodes of hypoglycemia. Heck, full-blown panic attacks can happen to anyone under stress! But, a City in a Place has resources, as Alex says. No, I do not have diabetes, and I have tried to research the condition as much as possible before using it, so I can only hope my information is accurate. It would have been nice if Colbey had been trained to recognize the symptoms and had given him some sort of simple sugar...but hey, she's not that nice.